It is quite hot out, so logically I would stay safe from the heat within the confines of my powder blue room with the blinds down. 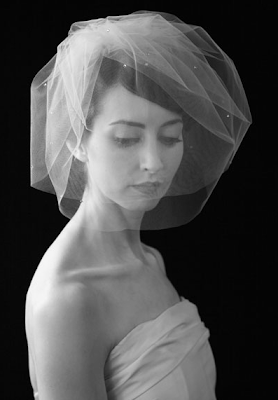 This important yet less thought about bridal accessory is in need of some attention today. And yes, most of what I shall be writing about these days will revolve around the subject of bridal clothing, etiquette and decor. I can appreciate most veil styles and give each woman credit for choosing one which emphasizes her personal style most. 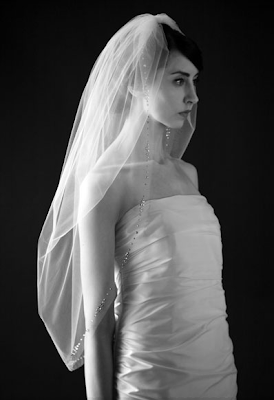 A veil is a subtle addition to your bridal outfit that takes the look where it is meant to go. 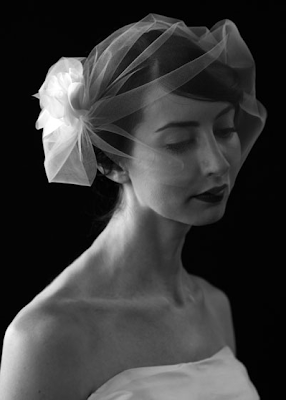 Meaning, the veil, or lack thereof completes your look. If you are a more modern woman who prefers to walk down the isle with a gorgeous French twist and nothing more, then so be it. On the other hand, if you are a lover of all that is traditional and will only walk to the beat of a floor length cathedral veil, that is simply who you are. As for myself, I personally prefer a more crisp fresh look. As a child I dreamt of sweeping down an isle like Princess Di, in a dress that could be seen miles behind me and a veil equally as long. Those days however are gone. Now, I prefer birdcages and the more 1960's inspired styles. A longer birdcage style, which can be pulled back to make a short bob-like bundle of tool behind an elegant bun. As for tiaras and all that ridiculous cheese, don't do it. Don't even go there, because your inner fictional princess will bounce out and grab that shimmering piece of tacky glitz and it will forever be planted on your head in wedding photos to come. All three of the veils pictured above are at the top of my list as of yet. As for making up my mind on which, I will leave that until the last minute.